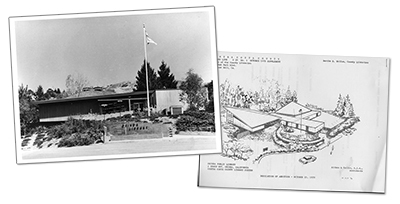 This spring, the Orinda Library will celebrate its 100th anniversary. 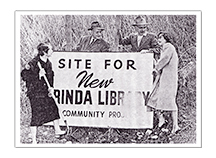 The power of community is at the heart of the one hundred year history of the Orinda Library. We might differ on whether the people who have resided in our town are “ordinary citizens” or extraordinary folks, but they had the foresight and drive to turn a four-by-four bookcase that had no permanent home in 1914 into a succession of public libraries that have been ahead of their time. In the past century Orindans have proven themselves to be people who believe in books and reading. Researching the history of the Orinda LIbrary for the 100 year anniversary has taken board members into the dusty archives of both the library and the Orinda Historical Society. Here are some of the unexpected surprises we discovered about our library……. A timeline of library history from 1914 to 1970 was created by a retiring librarian. The handwritten comment on the document reads “Summation made by Mrs. Hellum before her retirement March 1, 1972.” It was amended in the 1990’s and current board member, Linda Landau, has taken it up to the present date. Original board member and historian, Mrs. Betty Madison, wrote a charming article on the history of our library that is undated, but the last entry is from 1971. Her dedicated tenure with the library spanned a great deal of the middle of the past century and she has a unique perspective.